Advance Warning for Bylaws and parking information in the road or traffic ahead, this sign is used to inform drivers of Back-In Policy In Effect. 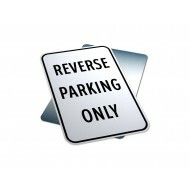 Reverse Parking signs are used as emergency response planning. In the event of an emergency, reverse parking policies have proven to make evacuation much quicker and safer. Reverse parking policies also decrease the probability of collisions as drivers are less likely to have an accident when leaving in an already front facing position, especially in rushed situations such as an evacuation. 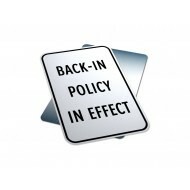 Purpose: Advance Warning for Bylaws and parking information in the road or traffic a..